Inspired by the natural beauty of the English springer spaniel, this sterling silver English springer spaniel charm is a lovely piece of handcrafted jewelry. The English springer spaniel charm would be a gleaming addition to any jewelry collection. Perfect for all English springer spaniel lovers. Approximately 1 inches x 1 1/2 inches in size. 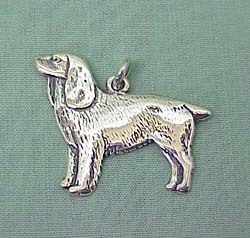 This sterling silver Springer Spaniel charm is a special piece of handcrafted jewelry. Each Springer Spaniel charm would be a gleaming addition to any Springer Spaniel jewelry collection. It makes a nice Springer Spaniel gift item. 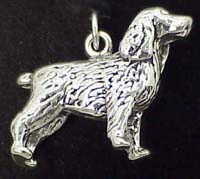 Approximate size on the Springer Spaniel charm is 3/4 inches.